At Beverly Dental Center, we are proud to specialize in dental implants! This state-of-the-art service is the ideal replacement for missing teeth, providing exceptional aesthetics, lifelike durability, and impressive longevity – in fact, most implant-retained teeth are able to last for the rest of the patient’s life with proper care and maintenance. Our experienced, highly trained dentists provide every stage of implant treatment here in-office, and our goal for you is a recompleted, revitalized smile that’s virtually indistinguishable from the original. Contact us today in Carrollton, TX to schedule a consultation. Once we’ve determined that the patient is a good candidate for dental implants, the first major step of their treatment will be the surgical insertion of the implants themselves into the jawbone. Here, they become your new “tooth roots,” creating an enduring foundation for the eventual restorations. For top-tier precision and safety, our dentists will use 3D digital X-rays, computer-guided surgery through Neo Navi Guide, and other state-of-the-art technology throughout this process. After the implant or implants have had sufficient time to bond with the jawbone, we will design the patient’s attractive, custom-made restoration(s). Our recommendation for this process will depend on your own personal preferences and the number of teeth/implants that require coverage. Are we replacing a single tooth? An implant-retained dental crown can be positioned between natural teeth without harming their natural structure. Do we need to replace several teeth in a row? An implant-retained bridge can be anchored in place with the help of two placed dental implants on either side of the gap. Have you lost a significant number of natural teeth? Many patients don’t realize that they may still be viable candidates for dental implants. 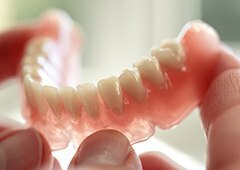 Implant-retained dentures look very similar to the traditional model, but they are designed to attach to strategically placed implants in the jawbone. This extra support is beneficial to the patient’s oral health, bite function, and sense of self-confidence – no unexpected slipping. 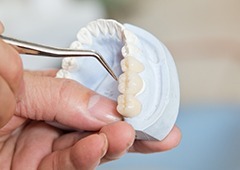 Implant-retained dentures can be permanently fixed in place or removable.